Israel has confirmed its intention to hold on to the largest settlement in the West Bank during any future negotiations on a Palestinian state. Deputy Prime Minister Ehud Olmert said Maale Adumim was inseparable from Israel and ruled out any concessions. Prime Minister Ariel Sharon revealed on Monday that some smaller settlements would be given up. Last month Israel withdrew from all its settlements in Gaza and four on the West Bank. The US has sharply rebuked Israel over its plans to expand Maale Adumim. 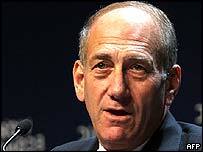 Mr Olmert told Israel radio the US understood Israel's position "without a trace of doubt". "I can tell you that Maale Adumim is an inseparable part of Jerusalem," Mr Olmert said. "The Americans know this. Everyone understands this. There is no chance that we will give up on this." The US has warned Israel against any activity that contravenes the roadmap peace plan or prejudices final status negotiations with the Palestinians. Palestinians also argue that building in the area will cut off Palestinians in East Jerusalem from the rest of the West Bank. Approximately 3,500 new homes are planned for Maale Adumim, east of Jerusalem. Mr Olmert refused to say when construction of the new homes would begin. On Wednesday, former prime minister Benyamin Netanyahu launched his campaign to challenge Mr Sharon for the leadership of the ruling Likud party in Maale Adumim. Mr Netanyahu said that if he was prime minister he would begin building the homes immediately in defiance of Washington.